Ayodhya Ram Mandir-Babri Masjid Case Supreme Court Today Live Updates: Protests broke out outside the apex court over the delay in hearing on Thursday. Ayodhya Ram Mandir-Babri Masjid case LIVE updates: A five-judge Constitution bench of the Supreme Court, headed by Chief Justice of India Ranjan Gogoi, on Thursday adjourned the Ram Janmabhoomi-Babri Masjid land title dispute matter till January 29 after one of the judges recused himself from the case. Justice U U Lalit withdrew from the case after advocate Rajeev Dhavan pointed out that he had appeared for former Uttar Pradesh chief minister Kalyan Singh in a criminal case related to the dispute in 1994. A newly constituted-bench will be formed ahead of the hearing at the end of the month. The bench is expected to hear 14 petitions against the Allahabad High Court verdict of September 30, 2010, ordering a three-way division of the disputed 2.77 acres at the Ram Janmabhoomi-Babri Masjid site, giving a third each to the Nirmohi Akhara sect, the Sunni Central Wakf Board, Uttar Pradesh, and Ramlalla Virajman. On January 4, the apex court had said that further orders in the matter would be passed on January 10 by “the appropriate bench, as may be constituted”. On October 29 last year, the court had fixed the matter for hearing in the first week of January. An application for an urgent hearing by advancing the date, filed by the Akhil Bharat Hindu Mahasabha, had been turned down by the top court. Supreme Court will begin hearing the Ram Mandir dispute today. Get all latest updates here. On Justice Lalit's recusal, the Hindu body said, "The other objection on Justice U U Lalit being on the bench is painful. Justice Lalit has never appeared in the Ram Janmabhoomi matters; neither at the trial stage nor in the appeal. His being Counsel of Shri Kalyan Singh in 1997 in the contempt matter casts no shadow on his hearing the present appeals. The objections were merely ploys to delay further." 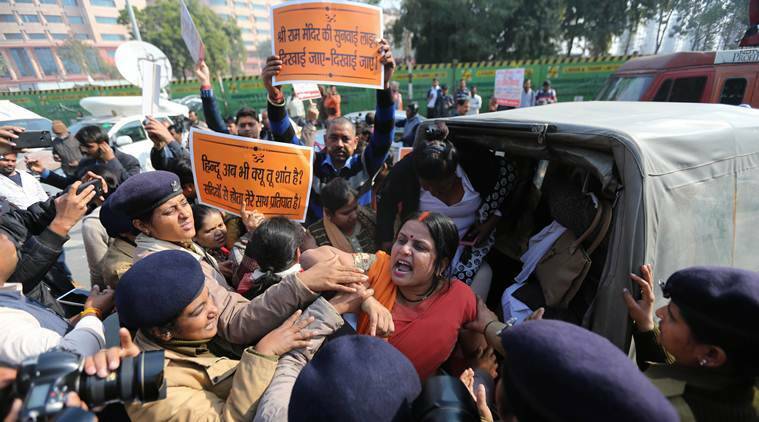 Reacting to the adjournment, Vishva Hindu Parishad, in a statement said, "Under the circumstances, an adjournment from 10 January to 29 January is rather long. Hindus are known for their patience and forbearance. The judicial system still has the responsibility of deciding the matters without undue delays. The country hopes that the Hon’ble Chief Justice, heading the present Bench shall decisively act to prevent the delaying tactics of the opposite party." The Supreme Court today adjourned the Ram Janmabhoomi-Babri Masjid land title dispute till January 29 when it will decide the schedule of hearing in the case. The case was adjourned after Justice Uday U Lalit recused himself from the case for previously being a lawyer in a related case. The court will now constitute a new bench ahead of the next hearing. Read full story. But whether the translations are right or not is not clear, the CJI said, further directing the SC registry to physically examine the records to determine their correctness. CJI Gogoi also asked the apex court’s registry to submit a report by January 29 on the amount of time that would be needed to hear the matter. While Dhavan pointed out that there was a judicial order referring the matter to a three-judge bench and wondered could it be heard by five judges, CJI Gogoi cited SC rules to overrule him and said there was nothing wrong with the procedure. Following Justice Lalit's recusal, CJI Gogoi will set up a fresh five-judge bench to hear the case. According to reports, Justice U U Lalit withdrew from the case after advocate Rajeev Dhavan pointed out that he had appeared for Kalyan Singh in a criminal case related to the dispute. What is the 1994 judgment? In the 1994 order in the Dr M Ismail Faruqui etc vs Union Of India And Others case, the court had said a mosque is not an “essential part of the practice of the religion of Islam, and hence “its acquisition (by the State) is not prohibited by the provisions in the Constitution of India”. The petitioners had contended that earlier decisions in the Ayodhya case were influenced by this statement and hence it should be re-examined by a Constitution bench. Earlier, on September 27, during a hearing of the Ayodhya land dispute case, a three-judge bench of the Supreme Court, by 2:1 majority, had refused to refer to a five-judge Constitution bench the issue of reconsideration of its observations in a 1994 judgment that a mosque was not integral to Islam. Dismissal of the plea to refer the matter to a larger bench had cleared the way for beginning of the final hearing of the appeals. On October 29 last year, the court had fixed the matter for hearing in the first week of January. An application for an urgent hearing by advancing the date, filed by the Akhil Bharat Hindu Mahasabha, had been turned down by the top court. On January 4, the apex court, which will hear the pleas against the 2010 Allahabad High Court verdict, had said that further orders in the matter would be passed today by “the appropriate bench, as may be constituted”. A five-judge Constitution bench of the Supreme Court, headed by Chief Justice of India Ranjan Gogoi, will begin hearing the Ram Janmabhoomi-Babri Masjid land title dispute case at 10.30 am today. The bench will hear 14 petitions against the Allahabad High Court verdict of September 30, 2010, ordering a three-way division of the disputed 2.77 acres at the Ram Janmabhoomi-Babri Masjid site, giving a third each to the Nirmohi Akhara sect, the Sunni Central Wakf Board, Uttar Pradesh, and Ramlalla Virajman. Follow our live blog for all latest updates. Earlier, on September 27, during a hearing of the Ayodhya land dispute case, a three-judge bench of the Supreme Court, by 2:1 majority, had refused to refer to a five-judge Constitution bench the issue of reconsideration of its observations in a 1994 judgment that a mosque was not integral to Islam. Dismissal of the plea to refer the matter to a larger bench had cleared the way for beginning of the final hearing of the appeals. In the 1994 order in the Dr M Ismail Faruqui etc vs Union Of India And Others case, the court had said a mosque not an “essential part of the practice of the religion of Islam, and hence “its acquisition (by the State) is not prohibited by the provisions in the Constitution of India”. The petitioners had contended that earlier decisions in the Ayodhya case were influenced by this statement and hence it should be re-examined by a Constitution bench.